The machine looks like an alien’s udder. Six blue spring-loaded teats from the stainless and flex-tubed contraption fill and staunch the olive oil flow into bottles. Each glass bottle disengages and moves to a table for corking and labeling. The bottling machine and its companion oil press are state-of-the-art equipment, the first ones in Texas. A slim man with silver hair stands nearby. He’s wearing deck shoes, jeans and a crisp shirt that matches lucid blue eyes. Jim Henry, founder of the Texas Olive Oil Council, runs this operation. His eyes gleam. For eight years he’s been waiting for the day this agricultural dream would come true. In fact, it makes logical sense for an olive grove to be in this area. With the right agricultural environment, olives can grow in the northern hemisphere belt of land between the 45th and 28th latitudes. Although Carrizo Springs lies in the sweep of that path, it was thought to be an area good only for some cattle ranching, not farming. In the late 19th and early 20th centuries, this land was called a “poor man’s heaven” because water, wildlife, grazing land, and fertile ground were abundant. The area’s year-round bounty resulted in the name “Texas Winter Garden Region of the United States.” The artesian wells seemed depthless, bubbling into running streams. However, by the 1910’s, drought, over population and poor water management affected the abundance of water. When the Great Depression hit, many farmers went bust and the water seemingly disappeared. This land remains as fertile as it was a hundred years ago. Fields of the famous 1014 onion stock—created here and godfather to the Vidalia onion industry— grow verdantly. Other farms in the area brighten the landscape with strawberries, herds of tethered watermelons, and spinach thick as groundcover. With water, this ground is pay-dirt that produces a biblical abundance. It’s something Jim Henry, a Dallas businessman, bet on. Among younger olive groves in the area, the staked trees stretch their limbs and tousled leaves toward the sun. This orchard is sixteen acres of newly planted saplings—11,400 to be exact—that will come to harvest in three-five years. Jim Henry, and fellow olive rancher, Jerry Farrell of Artesia Wells, Texas, farm the land for the Paul Conly family, who have lived on the land since 1911. Henry and Farrell will also develop a distribution center nearby for the produce. They plan to refurbish an old gin and turn it into a hygienic, refrigerated facility for olives, their juice, and other crops that need controlled, cooled storage. The idea glimmers in Henry’s eyes; those are the challenges and adventures he likes. This is not his first attempt with olives or farming either. He worked long hours during childhood on his grandparents’ Wisconsin dairy farm, and he didn’t plan to follow that line of work. Jim had a successful career with Tandy Corporation—he was a powerhouse buyer in Pier 1’s retail heyday—then pursued his own retail businesses to finally strike it rich with a commercial HVAC services company. This success in Dallas provided the opportunity for him to do anything he wanted. Henry bought land near Marble Falls and Devine, Texas. His first olive oil venture was a complete failure. He’d picked the wrong spot (it was too wet), the wrong part of climate (it was too cold), and the wrong varieties of trees (using Italian rather than Spanish and Greek stock). During one winter, a freeze killed the trees. But Henry was determined to overcome the problems. “I’ve always been curious and believe that if you can’t think independently— be curious—you’ll miss life,” said Henry. 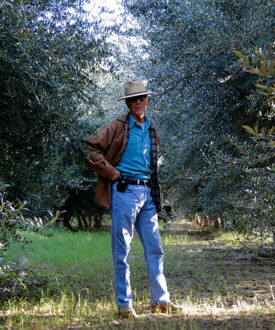 Henry met Don Delanardes, a third generation American-Italian and olive grower in Visalia, California. His heritage farming methods mentored Jim’s quest. In 1996, a group gathered with Henry in San Antonio to discuss growing olives and ask him to plant olive groves for them. The groves thrived; the idea was viable. Driving back into Texas Olive Ranch beside the mature groves, it is easy to imagine being in Spanish groves as we drive alongside the lush trees. When asked about irrigation for an area that had a history of drought, Henry laughed. “Yeah. Well, there’s plenty of water when it’s managed right. We’ll take a mule out when we get back to the barn and I’ll show you,” he said. The “mule” is a mechanical green truck a bit larger than a golf cart. Jim stops to show off the olive flower buds just opening. The discreet white blooms faintly smell like olives. He is pleased to find these blooms, but he would like to see more. Blooms covered the trees this time last year. When asked what is different this time around, he answers, “We don’t really know yet. It’s all a gamble; no one seems to know how much water, nutrients or fertilizer is too much or too little for the trees. The land—its environment fluctuates—creates its own terroir for productivity, taste, and abundance each season”, he explained. The trees stand row after row like hedges, orderly, and peaceful. The solitude among them is palpable. We see cottontails and jackrabbits, a bevy of quail, chipmunks and lizards. Rattlesnake carcasses hang on the fence; tarantulas are scooped out of the warehouse. Caracara hunt and dive, scavenge the leftovers. A mountain lion and coyotes hunt frequently. The trunks are trimmed to avoid harvester damage and allow easy fertilizing access. Once these chores are done and the trees look happy, there’s little else to do except water, fertilize and wait. The next stop on the tour was the well which produces 450/gallons/minute. Each row of trees has a water line buried beside it. A foreman turns the well’s spigot to water the crops via this uber-drip method. The amount of water used is measured; little of it is wasted by evaporation. When asked why these trees and this project are so important to Henry, he responds, “The economy here is depressed. Many residents rely on welfare or transient work. With a new agri-industry like olives and specialty foods, Carrizo Springs can again be productive land that not only nurtures this industry, but revives an area with a productive population. It is an ethic he has followed since childhood. “You know, when I was ten years old, living in Nevada, the schools made us take aptitude tests. The results of my test predicted that I should be a farmer.” He shook his head and smiled. Is this farmer and other olive keepers in the area creating an industry or a folly? Time will tell. But it’s obvious in the way Jim Henry talks about the land, the trees, and this nurtured dream that his passion will make the difference.